When Martin, my typewriter collector friend, invited me to see “a little something from Paris,” I had never heard of the Dactyle typewriter. Nor did I realize I was about to learn the story of a French engineer/inventor who helped the blind communicate. Moreover, I encountered a mystery I need help to solve. 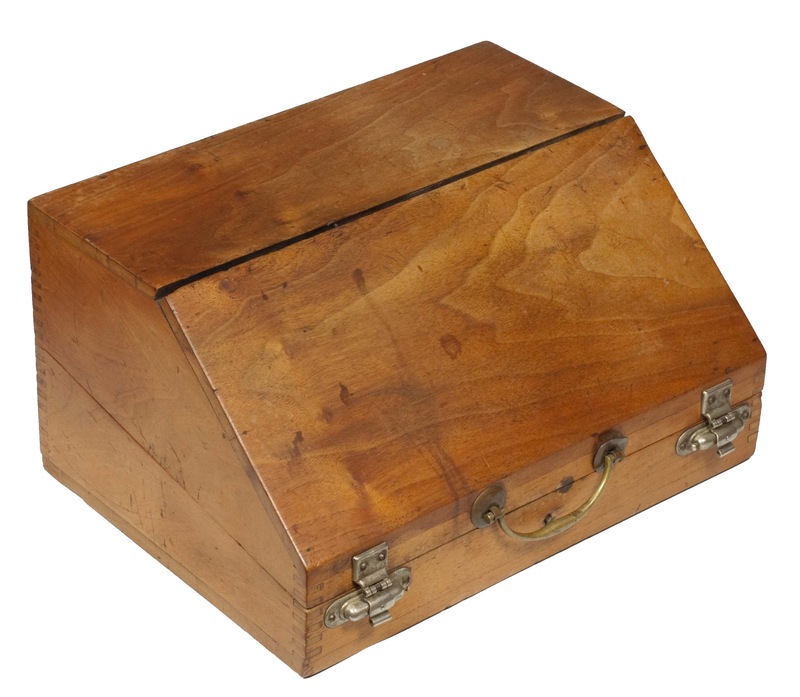 The typewriter that Martin took from this box at first looked familiar. The spidery-looking keys, the cylindrical type-sleeve at the top, and the folding space bar in the middle all said “Blickensderfer 5” to me. 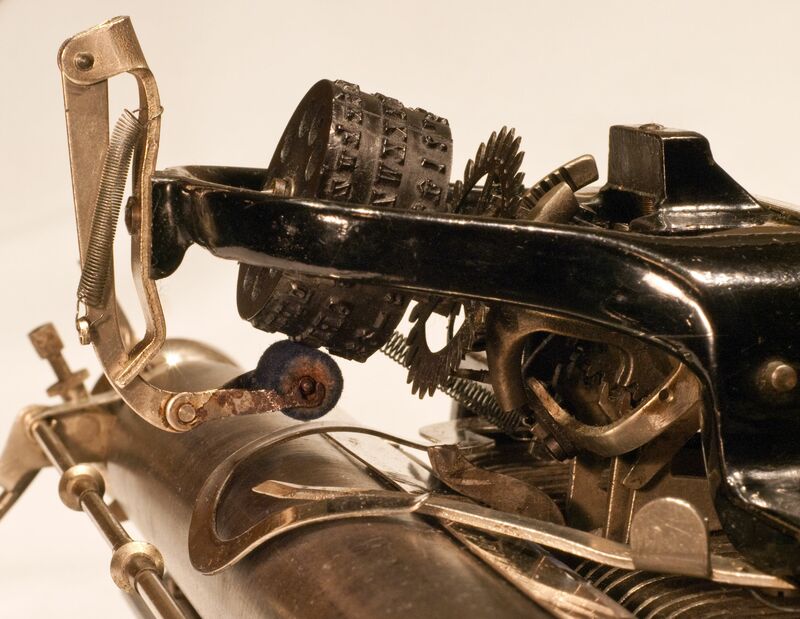 I have long admired the look and ingenuity of Blickensderfer typewriters. In the model 5, the cylindrical type-sleeve did not get out of alignment, and could be changed quickly, to alter the font or even the language. Moreover, with 28 keys there were 84 character possibilities. Look closely at the image below. Here the inking wheel is making contact with the uppercase letters, which are in the middle row. The top row of letters is for lowercase and the bottom row is the symbols and numbers. To select the Upper Case, one would press the lower left key marked Maj [Majuscule] and for symbols, Chif [Chiffre]. The name Dactyle appears on a significant number of Blickensderfer typewriters. The Dactyle was marketed primarily in France, although many were sold in Belgium and some in the French-speaking parts of Switzerland. The earliest known specimen has the features of the early No. 5… The Dactyle keyboard placed the most frequently used French letters in the first row and included special French characters. This was helpful, but I wanted to know who was behind the Dactyle name and operation. My first clue came with a 1904 ad I purchased on eBay. At last I had a name. O. Rochefort, engineer of arts and manufacturing. This ad was for a calculating machine. It didn’t mention typewriters, but the address was 46, Boulevard Haussmann. (The site is now that of the department store Galeries Lafayette. In about 1911, the company moved to 4, rue Lafayette.) With the help of a German-language website and a Dictionnaire biographique des grands commerçants et industriels available from Gallica, I put together part of the human story behind the machine. Octave-Maximilien Rochefort, 1861–1950, was an inventor and manufacturer. He was a restless man, who travelled widely. After graduating from the École des Arts et Manufactures in 1884, he went to Algeria to work in forestry for two or three years, returned to France and soon left for Argentina in 1887. In Cordoba he was a public works engineer, involved in bridge building, and he even taught at the university. He returned to France in 1890, but left shortly thereafter for the coal mines of the United States. Clearly, Octave-Maximilien had an eye for new opportunities. In 1896 he returned to Paris to set up a typewriter factory and sales outlet. He is best-known for the Dactyle (a rebranded Blickensderfer) and the Hall Braille-Writer (see below) and what has been described as “the Harrison machine to impress Braille characters on copper sheets for printing Braille characters.” In addition to making the Hall Braille-Writer available in France, Rochefort also sold Dactyles where the typewriter keys had raised Braille characters to assist the blind in writing inked text for the sighted to read. How did he make the transition from bridge building and coal mines to typewriters, including typewriters for the blind? During the years of Rochefort’s stay in the United States, the most important and highly publicized technology showcase took place in Chicago in 1893: the World’s Fair Columbian Exposition. It was a stunning display of new technology from dozens of countries; the kind of event that would attract the curious and restless Rochefort. It is more than likely Rochefort attended the Exposition. Typewriters were one of the hot technologies of the day and Blickensderfer was one of 23 typewriter manufacturers exhibiting. The award-winning Blickensderfer 5 appears to have captured the show and yet in the difficult financial year of 1893, Blickensderfer was in deep financial trouble. It is not difficult to imagine that George C. Blickensderfer and Octave Rochefort met and talked business in Chicago before the fair ended October 29, 1893. Or perhaps a conversation that started in Chicago continued later. At some point, Rochefort acquired significant non-American rights. 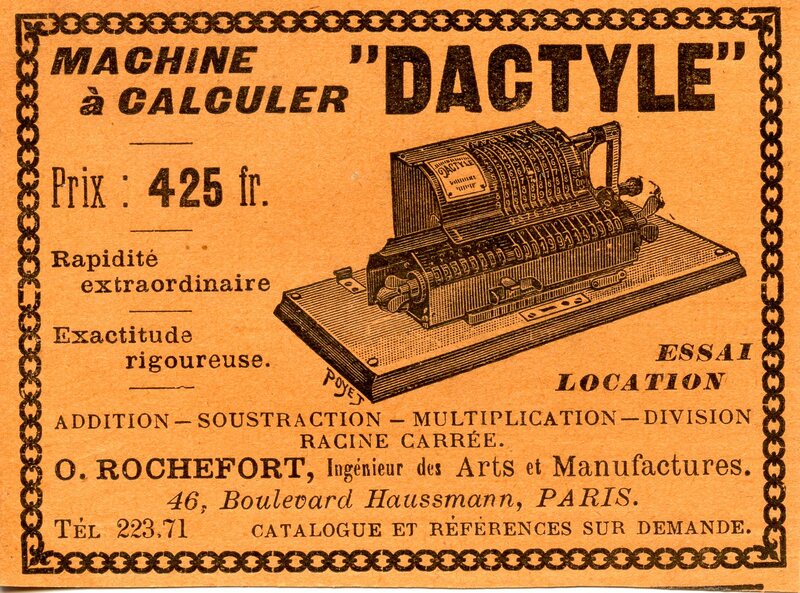 Rochefort was advertising the Dactyle in French as early as 1896. And what else might Rochefort have seen at the Chicago World’s Fair? The Illinois Institution for the Education of the Blind was also an exhibitor; its star attraction was the Hall Braille-Writer, invented by superintendent Frank Haven Hall. Through his work in bringing the Hall machines to France, Rochefort joins the ranks of 19th-century benefactors of the blind. Rochefort was also an important inventor in his own right, but that is another story. I am currently researching and writing about the plight of the blind in the late 19th century and the efforts to help them read and write. What started with Martin’s invitation to view the Dactyle, a typewriter for the sighted, has provided me with new research clues. That machine is now owned by a collector in England, but I am delighted to have had a chance to see it before it left Canada. In the introduction I also mentioned a mystery. What is the meaning of this symbol which appears on the frame of the Dactyle? Could it be related to the Dreyfus affair? Rochefort’s father was strongly anti-Dreyfus. Perhaps Octave was asserting his opposition to his father’s stance. Who can provide any further ideas? Text by Norman Ball; typewriter photographs by Martin Howard. Portrait of Rochefort from Gallica. * Robert Blickensderfer and Paul Robert. The Five-Pound Secretary: An Illustrated History of the Blickensderfer Typewriter. 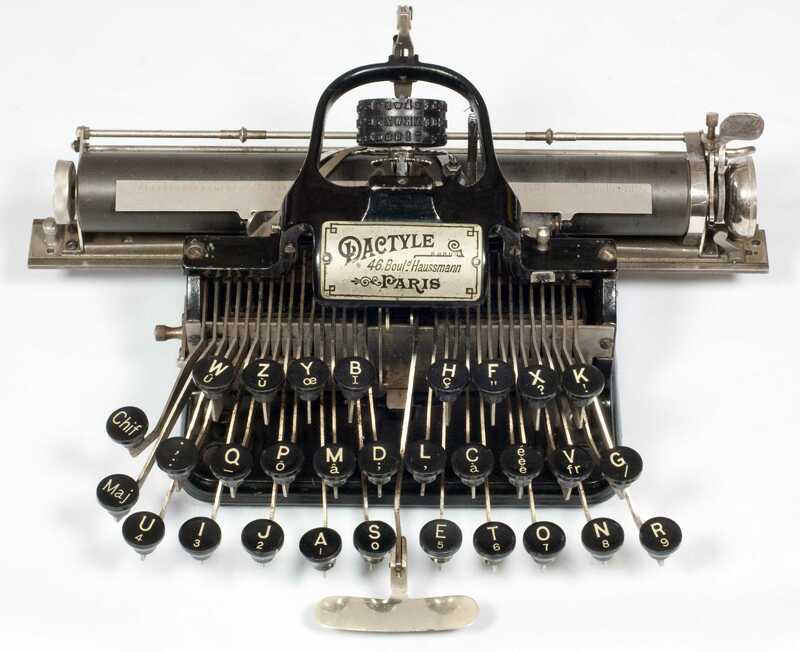 Laren, the Netherlands: The Virtual Typewriter Museum, 2003. This entry was posted in Paris history, Paris typewriters and tagged antique typewriters, Blickensderfer, Boulevard Haussmann, Columbian Exposition of 1893, Dactyle, Frank Haven Hall, Martin Howard, Octave-Maximilien Rochefort, typewriters. Bookmark the permalink. Great story! I know you found that Hall was more interested in helping the blind than in making money. But not taking out a patent on the machine (because he wanted it to be manufactured and used as widely as possible with no fees) was a naive response. 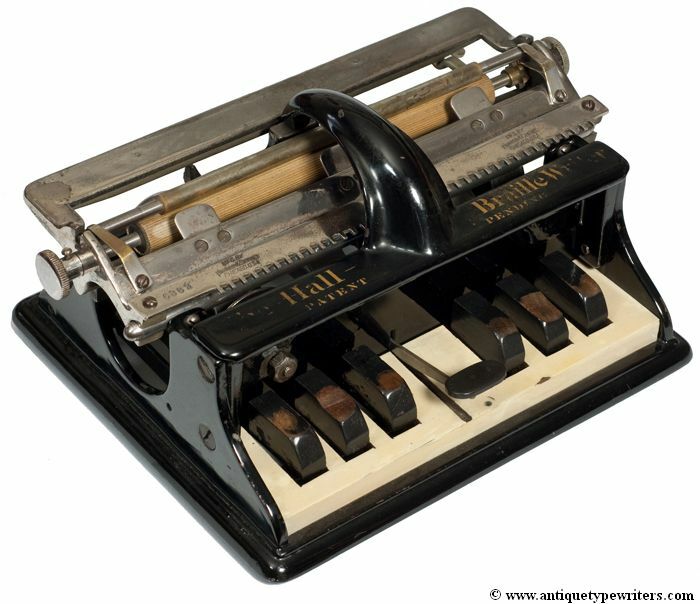 Anybody else could have taken out the patent for themselves – as heaps of people were interested in developing type writers, Hall was running a huge risk.. Thank you for your interest Hels and at first glance it might seem Hall was naive. He was in fact very astute. He and others knew there would be limited demand for the Braille Hall-Writer. He worked hard to create demand for a low-priced machine that found favour with both schools for the blind as well as with blind individuals. There would be no economic incentive to try to rip off his invention. The “heaps of people” interested in developing typewriters often lost money. It was a very tough business for mass market machines and even harder for niche market machines. I too find the Rev. Thomas Oliver and his machines fascinating. Also, Hels makes a good point about patenting and not enforcing, vs not patenting in the first place. How different was the intellectual-property landscape back then? Thanks Polar Weasel for catching me on calling it a German site. I tend to write long drafts and then editing starts; in that process a German language site became a German site. I will change it. 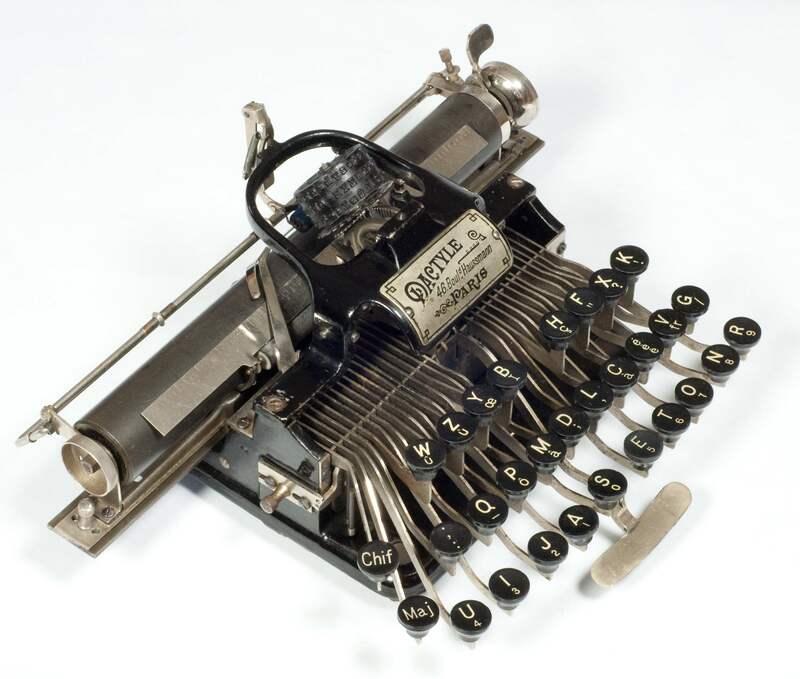 As regards the intellectual-property landscape in the late nineteenth century there were plenty of patents, there was a very powerful typewriter patent cartel and many a typewriter design was strongly influenced by the need to avoid litigation. There was also a great number of what I can only call “hobby inventors” or “weekend inventors” who came up with ideas for which there was clearly no possible market and this is part of what makes patent literature of the time such a fun read. I think many of the inventors were having fun or maybe were harmlessly obsessed. In between the extremes we find a man such as Hall who saw typewriters as one of the key technologies of the day. He was also an outsider, a disruptive force. First, he had not come from the typewriter industry. Second, he had no experience with the blind before he was appointed Superintendent of the Illinois School for the Blind. Hall saw the largely ignored needs of a particular group whose education and lives were generally characterized by a severe shortage of funds and he looked for ways to make improvements. He was able to do so largely outside the world of patents of invention, legal fees and infringement suits. plight of others and whose goal was not the accumulation of wealth. As the new caretaker of Martin’s wonderful Dactyle which is on its way to the UK, I did enjoy your very interesting piece about M. Rochefort, and his other machines. 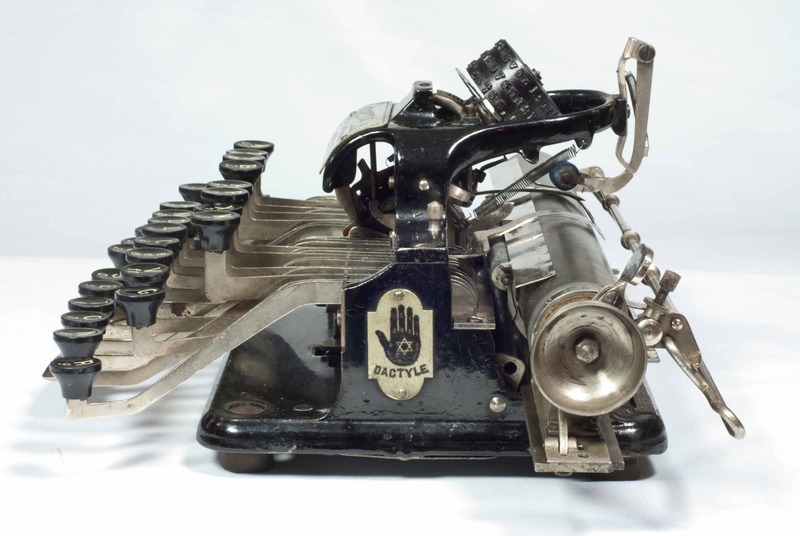 The symbol on the side of the typewriter is a stylised ‘Hamsa Hand’ a middle eastern symbol of good fortune and protection against the ‘evil eye’. The Star of David makes it the Jewish version of this. I have tried to find out more about it, and why Rochefort used it, without success so far. I agree with your supposition that it could have been a gesture of defiance against his notorious politician father, an ardent anti-Dreyfus campaigner. 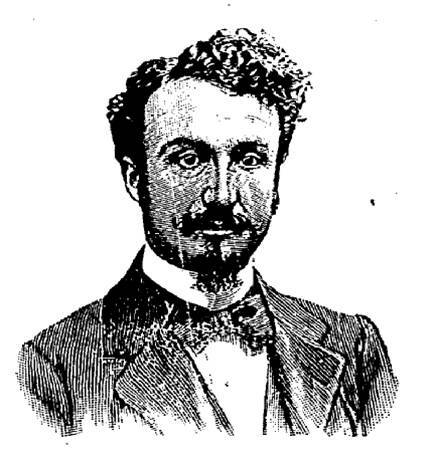 Camillo Olivetti was also inspired by the 1893 Chicago Fair to start his own typewriter business. Your fascinating Parisian blog makes me want to jump on the Eurostar this afternoon!